Animals have emotions. I know, I am preaching to the choir. We - dog people - already know this. Still, I want to highly recommend this book, "Mama's Last Hug. Animal Emotions and What They Tell Us about Ourselves." Maybe as a blogger about dogs, or maybe it is something about my generation, I am always weary of the elephant in the room. Anthropomorphism. The attribution of human traits, emotions, or intentions to non-human entities. Do I attribute emotions to Tilde and Zerline which are not really there? Do I only think I see it, because I observe them through my human filter. Do I just want to see it? Science never seemed to be on my side. The public discussion in Denmark seems to be dominated by the likes of Bengt Holst, zoologist, director of Copenhagen Zoo and president of the Danish animal ethics council. Not shy of seeking publicity through the media, Bengt frequently pulls the anthropomorphism card, or another one of his favorites, the "disney-fying" card. Nature is cruel according to Bengt. It is about survival of the fittest. About instincts and behavior. Emotions other than the basics like fear and anger, are human traits. But then I know what I see when I observe Tilde and Zerline. It isn't a coincidence when I think I can recognize empathy, distrust, guilt, joy, disgust etc. I struggle when I write about it. Just a couple of weeks ago I wrote about Tilde and how I observed how she clinched to Merete during and after my period of hospitalization. Tilde had to understand and remember her past, in which she was frequently re-homed. But she also must have had a notion of the future, the way she clinched herself to Merete. Is that at all possible? A dog not only remembering, but also planning the near future? I settled for the conclusion, that dogs live complex emotional lives too, even though it is not always revealed to the human eye. 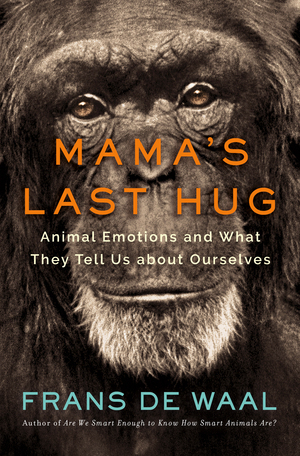 According to the author of the book, Frans De Waal - primatologist - animals do possess emotions. Even more than that. We mammals all share the same emotions. There are no emotions which are reserved for humans. In fact, Frans taught me a new word today. Anthropodenial. The opposite of anthropomorphism, “a blindness to the human-like characteristics of other animals, or the animal-like characteristics of ourselves.” Take that Bengt & co. I love science and how it evolves. If it didn't, we would still believe the earth was flat. The book didn't only confirmed me in my belief that following my emotions about Tilde and Zerline was correct, and a lot we hear from the anthropomorphizing gang is wrong, it also gave me something to think about in a totally different area. I like to see myself as a responsible dog person and do my best to train Tilde and Zerline accordingly. I did my homework on behavioral science, what positive/negative reinforcement and positive/negative punishment means, and how it can be applied. After reading "Mama's last hug", I realized I have to raise my awareness. Behaviorism has a huge pitfall in which we mistake animals for stimulus-response machines. The one size fits all treatment doesn't always work. Like my attempt to click the chase out of a predator - read Tilde - is futile. I do feel liberated after reading the book. We people do like our logic and reason. Maybe my reluctance with the subject of animal emotions wasn't only that I credited Tilde and Zerline for having emotions, but also that I was following my own emotions to think so. Now I know, it was not only the right thing to do, it actually also shows how similar and connected we truly are. Now go read the book!